I know, I hardly ever do bottle shots! But, I wanted to show you how it takes on a slightly greener color when it's only 2 coats on the nail. Cardigan - amazing formula, good at 2 coats with vnl and I actually love it that way, opaque in 4 coats. High shine and perfectly self leveling! Swatches are without top coat! These first photos are 2 coats. These last 3 photos of Cardigan show 4 coats! Except on the thumb, I left that one at 2 coats so you could see the difference. This polish was super easy to apply. No streaking or dragging whatsoever. These are showing 2 easy coats, no top coat. No problems in application at all. Great coverage, self leveling and shiny! I am super impressed with these. The colors are great, but even greater is the formula. I look forward to having more Pomegranates in my collection :) Shop for them at Pomegranate.com and like them on Facebook. That black polish is quite interesting! I love these two colors you have chosen. They are beautiful and it suits you very well too. 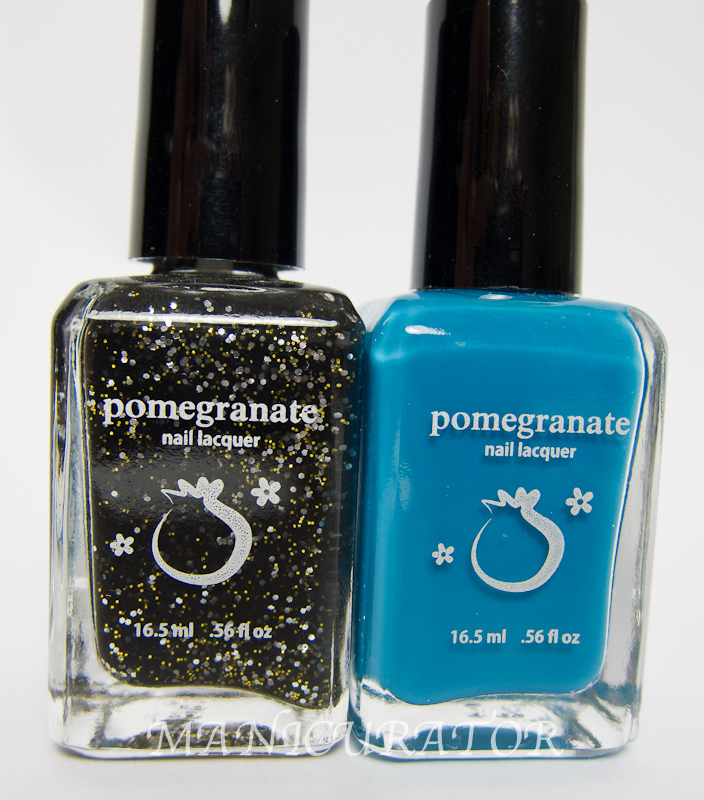 Will be trying this polish very soon. Thanks for the great description. I love them both, but I had not seen Cardigan swatched before! It's stunning! 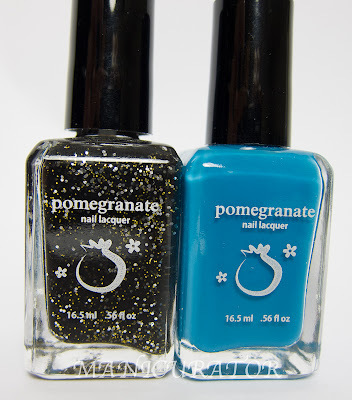 I sooo need to spend the $ and put in an order with this company...I am in a phase where I hate buying more polish because it's often a disappointment if I cannot see them in person first - plus I hate to pay anything much for shipping charges. But I keep seeing this brand and love the shades and finishes. Glad you showed how sheer Cardigan is however - not sure it would be all that different from the jelly this fall that Zoya put out - this one looks a bit brighter - less dusty maybe. omggg I need these both! Beautiful! I love Curator too, but I really think I need Cardigan now! I love!! Cardigan is pretty both ways. I have Curator and I can't wait to try it!! Ok, I already had Curator on my wish list, but now i can add Cardigan as well!! WOW! Love the teal color & LOVE your pics! Woooow that blue jelly is so gorgeous!!! Thank you Angela :D Hope Santa is good to you! Ooh a shop in Singapore supplies them and shipping is so cheap, so I've ordered. I really need a swap buddy though. Thanks for the swatches and inspiration!